Not my reality TV, either. THEIRS! 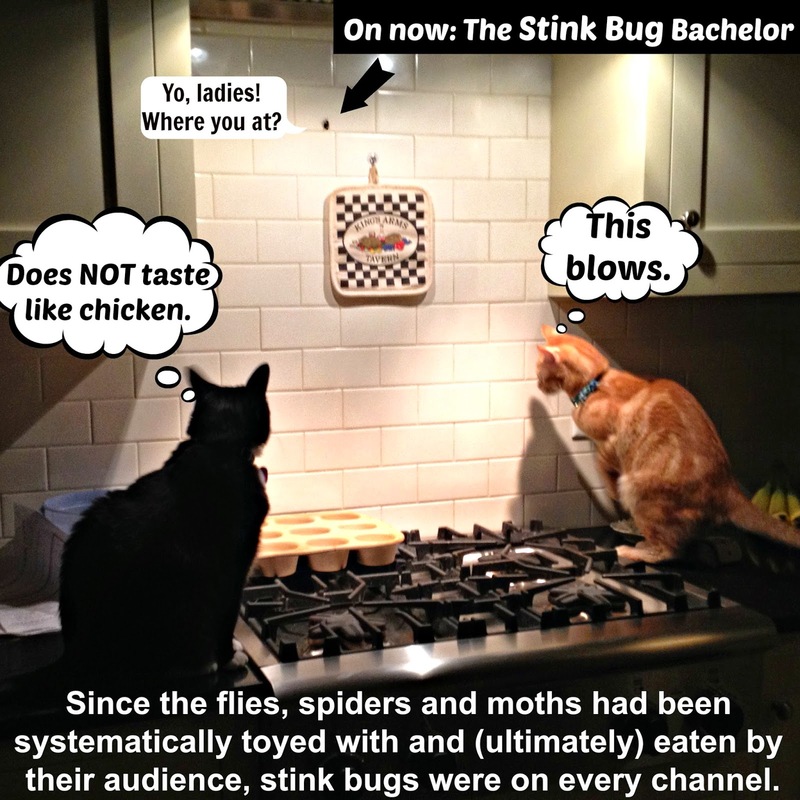 I don't know how long they sat there and watched that stupid (ugly, nasty...) stink bug the other night, but I KNOW they didn't kill it. Stupid things are too gross even for cats! Corgis, too! ICK! If you'd like me to consider a photo of you pet(s) for a tacky cardigan, just post it to the Facebook page! I dead flies by eating them. Peeps thinks that is gross. Have a wonderful Wednesday. All insects are toys to my cat, toys that are to be tortured and killed before being discarded. Makes me glad I am above her in the food chain. No, my dogs pay no mind to bugs. Jimmy watches real TV and Wilson is obsessed! with watching out the front window. I wouldn't mind stink bugs if they would just stay outside. They seem pretty harmless compared to ticks and mosquitoes. Oh yeah...we like watching the bugs that come in the house...and we play with them until they can't take it anymore. Heheheh. I am a consummate fly catcher when the flies get in the house. All Ma hears is >snap, snap, SNAP< of my jaws and then, the fly is gone. Stink bugs...pee-yooo...no way I'm touching one of those! LOL! They were easily entertained I guess!